It is Sunday, the Sunday before a bank holiday Monday no less, and I am in Cumbria. Of course it is like this. If I am going to get wet, I might as well do it properly. Somebody told me the day before that Buttermere was the wettest place in England, officially. But there’s a reason why swimmers are always saying “it’s lovely once you’re in”, it’s because it’s true. And yes, my friends, I freely admit that that is me with the neoprene gloves and socks on. I have become a convert to them in the last month, in this unseasonally chilly spring when yesterday’s 8.5 degrees was not as bad as I was actually expecting. I shall forgo them as soon as we hit double figures, but until then, I’ve become impatient for small creature comforts. 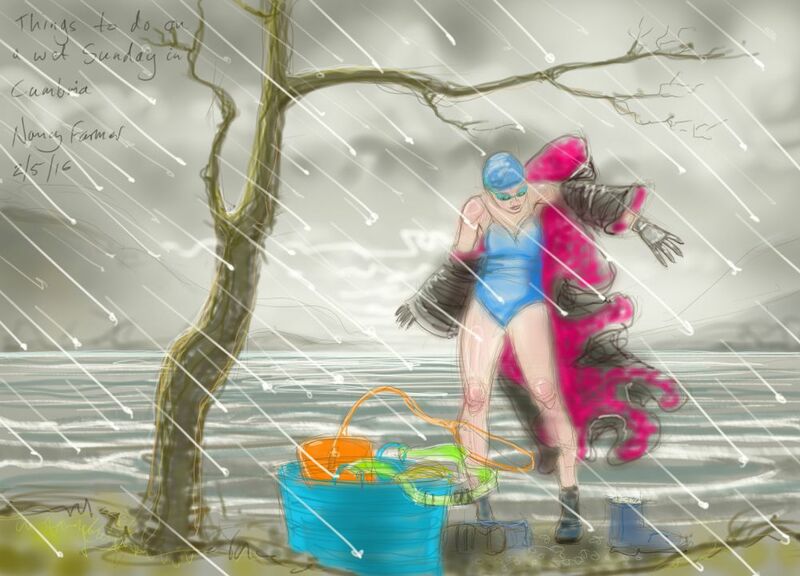 This entry was posted in showcase, swimming and tagged art, Buttermere, cold water swimming, Cumbria, drawing, illustration, open water swimming, rain, swimming, The Lake District on May 2, 2016 by Nancy Farmer.